A lifetime of service in politics and journalism. Mabel Strickland was one of Malta’s most distinguished and colourful personalities of her time. Like her father, Lord Strickland, she had a deep passion for politics, but she made her mark as editor of two English language newspapers that are today considered as an institution in Malta. 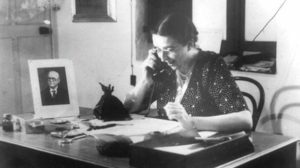 Mabel Strickland, then editor of The Times of Malta, taking the first public call. She was elected three times to parliament, but it was mainly for her role as editor of the Times of Malta and The Sunday Times of Malta in the Second World War that she was admired most. Through her courage and work in publishing and editing her newspapers, even during the worst times of the war, she helped in no small measure to keep the island’s morale high throughout the siege. The press building in St Paul Street, Valletta, received two direct hits during the war, but her newspapers never missed an issue. For her contribution to the war effort, Miss Strickland, Malta’s press baroness, was appointed a member of the Order of the British Empire. Miss Strickland was ushered into politics and journalism in 1921 when her father, Lord Strickland, published his first newspaper, Progress, and set up his political party, Anglo-Maltese Party, four years after his return from his last governorship post in 1917. Within a short time, his party merged with the Maltese Constitutional Party. Lord Strickland, 6th Count Della Catena, was chief secretary to the government for 13 years before he served in four governorship posts in the service of the Crown. He first served in the Leeward Islands, and then, successively, in Tasmania, Western Australia, and New South Wales. 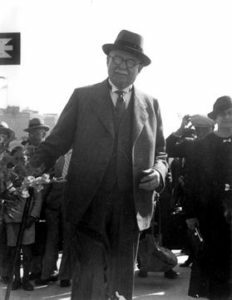 He was Prime Minister between 1927 and 1930 and for a time sat in two parliaments, that in Malta, and in the House of Commons as an MP for Lancaster. He was raised to the peerage in 1928. Miss Strickland loved her father and worked with him closely until his death in 1940. The Stricklands come from the Sizergh branch of the Stricklands in Westmorland, “a line of honourable ancestry”, and can trace their link with the House of Commons to as early as 1290. A Strickland had the distinction of carrying the banner of St George in the battle of Agincourt in 1415. The Stricklands established roots in Malta in 1858 when Mabel Strickland’s grandfather, Walter, a commander in the Royal Navy, married Donna Louisa, daughter of a Maltese nobleman. Miss Strickland played a leading role in the building up of Strickland House newspapers, particularly in the running, mainly as editor, of the Times of Malta and The Sunday Times of Malta, two newspapers that have been playing an active part in the island’s social and political life right from the time they were established in the mid-1930s. They are still Malta’s leading national newspapers. She was editor of the Times of Malta from the time it was set up in 1935 up to 1950, when she decided to go into active politics, and of The Sunday Times of Malta, up to 1956. Deeply involved in her father’s work in politics (she was assistant secretary of the Constitutional Party from 1921, when Malta was given its first self-government Constitution, to 1945) and in newspaper publishing, Miss Strickland sought to follow in his footsteps when she contested the 1950 elections under the reconstituted Constitutional Party, of which she was vice-chairman. She felt it was a “genuine sacrifice” to give up being a working editor to go into politics but she believed she had to do it because it had become a public and national duty, “which one’s conscience could not ignore”. 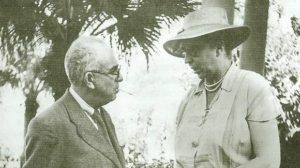 Paul Boffa with Mabel Strickland at the time she was leader of the Progressive Constitutional Party. In 1953, she set up her own political party, Progressive Constitutional Party and took part in the Malta Round Table Conference of 1955, the constitutional talks in 1958, and the Malta Independence Conference in 1963. Miss Strickland was a firm believer in the British Commonwealth and, as honorary corresponding secretary of the Royal Commonwealth Society for many years, worked hard to promote the Commonwealth ideals. She was also a life member of the Commonwealth Parliamentary Association and a council member of the Commonwealth Press Union. Considered as one of the island’s most colourful personalities of her time, “Miss Mabel”, as she was more popularly known, had a sympathetic ear to all who called on her for assistance or word of advice. She was also very generous. Miss Strickland considered the time she edited the Times of Malta and The Sunday Times of Malta as the best years of her life. She may have been conservative in her politics, but she was never afraid of facing up to the challenges that the new printing technologies presented. Indeed, she herself supervised the first phase of the new generation of phototype setting at her press. Were she alive today, she would stare in wonder at the giant steps the enterprise she had piloted with so much care has taken in modern printing techniques. And what would she have made of the development of the social media today? In all probability, she would have loved the new media as well.